Before we explain exactly how you can spot brush heads that are not manufactured by Oral-B, we’ll just point you to where you can buy them online, safe in the knowledge that they are the real deal. 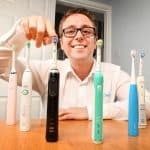 We often link to various brush heads throughout our reviews, but we also have a post that compares Oral-B brush heads. In this post we link to the various brush heads on Amazon. These are official Oral-B brush heads, so if you buy these you can be sure that they are not fake or replica. When it comes to buying any product we can be easily led into believing we are buying the real thing when it is infact a fake. At times, many of us will knowingly buy the fake as there is a cost advantage to doing so. 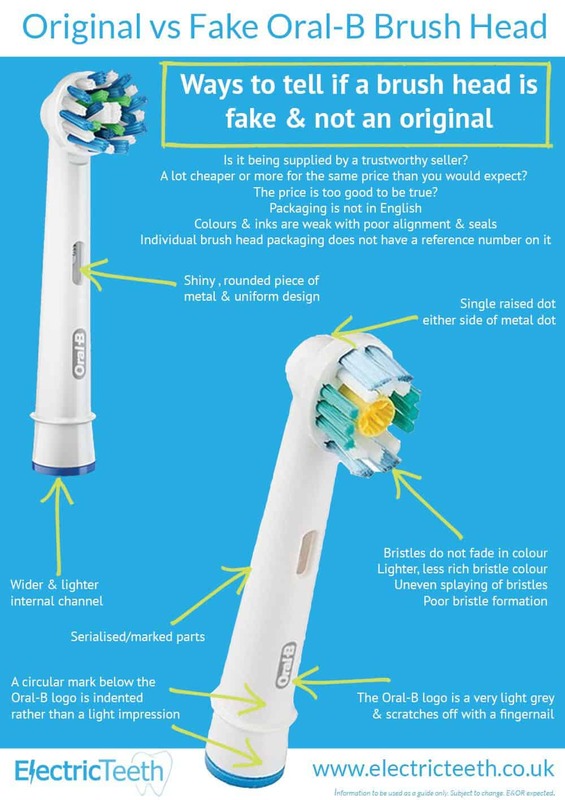 When it comes to your electric toothbrush and Oral-B replacement brush heads, be that for your Pro or TriZone brush, DO NOT let yourself be led or fooled into purchasing a fake or replica – know the differences. Please see the photos in this gallery, alongside the detailed instructions below, for assistance in spotting fake Oral-B brush heads. The best replica, fake or counterfeit brush heads will come packaged and look like an original. Most of the time, many of us would find it very difficult to actually tell the difference but there are some key things to look out for, which will allow you to decide whether they are fake or not. It is not until you get home, start unpackaging the product and using it that you may have cause for concern. You can’t open and try them in the shop or always tell from images online. Further down this post is a list of key identifiers that make it possible to tell the difference between a fake and real brush head, but before we show this, here are a couple of things to consider before making the purchase, to avoid purchasing a fake. Buy from big name stores like, Tesco, Sainsbury’s, Boots, Superdrug and Amazon (not third party sellers). They have policies and regulations that reduces the chances fakes or replicas being sold. These big name stores generally work direct with the real manufacturer. If your local big named store is selling the brush head you want for £10 per pack but Geoff’s cosmetic market stall has the same product for just £5, question why. How is it there is such a price difference? How can Geoff sell it so much cheaper? These are typical pack sizes. Be wary of other odd number pack sizes or those that do not come in an individual pack, as thus could be an indication that they are fake. Consider the deal as a whole. Does the price, product, reviews all sound too good to be true and you seem to be getting the bargain of the century. It is usually an indicator that something is not quite right. The following are a list of known differences between a genuine, Oral-B manufactured brush head and counterfeit/fake/replica brush heads sold online or in store. Depending on the source the differences and signs of the fake may differ. The following is intended as a guide only. Not all fakes will exhibit these faults or flaws, but as a broader rule a fake or copy will show some one or more of these identifiers. Receiving packaging in any other language, particularly Chinese if you are not in China, should act as a trigger for you to investigate further. German may possibly appear as Braun Oral-B is of German origin, but fakes can also be produced with German language. Is the writing on the back bolder and darker? If thin, poorly aligned, weak colours then the heads contained within could be fake. On the individually sealed brush head packaging, is there an 8 digit reference number? If not, it could be fake. The Oral-B logo will not scratch off. The Oral-B logo on a fake brush head will often be lighter in colour and can be scratched off with a fingernail. A small circular and noticeable indentation towards the bottom of the brush head shaft, underneath the Oral-B logo will indicate a possible fake. On an original the circle is present but raised/slightly impressed. A fake has a circle clearly indented into the shaft. Look inside the oval cutout/slit on the front of the brush head. Inside you should see a metal piece which moves when the brush is in use. A real head will have a nice shiny metal with little in the way of imperfections and a uniform screw effect. Fake brush heads may well be less uniformed, less polished or made up of a different material. On the back of the brush head the oval cutout should contain a piece of usually white plastic, often with some sort of reference number on it. Looking up and inside the shaft of the brush head, the original Oral-B will have a narrower darker channel compared to a fake. An original will over a 3 month period will gradually get lighter in colour, with the colour remaining strongest for the longest time at the bottom of the bristle. The colour fades from the top of the bristle down. On an original brush head used for 3 or more months, the bristles will begin to point in different directions and not be in the same tight formation as they were new. However there will appear to be some order to this splaying of bristles. If the bristles are all over the place and generally really messy, you can be pretty sure it is a fake. On the top of the brush head, there is a metal dot in the centre and a single dot either side. If the single dot is raised the brush head is likely a fake. An official Oral-B head will have a recessed dot either side. On the back of the original brush head, there is often one opening in the lower third of the plastic body. A copy or replica may have multiple openings, although originals have been known to have multiple openings. It is worth noting that there are companies and sellers be that in a high street store or online who will not claim to be selling genuine Oral-B brush heads, but will state them as compatible with Oral-B brushes. It is not right to suggest these are fake or counterfeit in that they are not claiming to be an original Oral-B manufactured product. If you have concerns about any brush heads you may have purchased or be looking to purchase yourself, then it would be worth contacting Oral-B directly to make them aware and getting their opinion by calling their freephone number: 0800 783 7010 (UK) or 1800 509 448 (ROI). So if the price is significantly lower, you suggest this points out a fake. Could it be possible that a seller may be selling a genuine product but isn’t as greedy as some larger companies with the profit margins? I have found genuine Oral B toothbrush heads are significantly lower prices than, say Walmart/Asda stores. For example, an 8 pack Cross Action set of heads costing £30, are available from online sellers at half the price. On receipt, and subsequent checking against your photos above, they have turned out to be genuine. I think it is slightly disingenuous to state that cheaper indicates fake, when this is often not the case. Sometimes it is just about maximising profit, or just plain old greed. Perhaps we could have worded it better within the article, but our intention is not to say just because it is cheap it is a fake. What we are saying is that the cost can be a very strong indicator to whether it is a fake or not. Some sellers, are selling genuine Oral-B heads at a very good price, much cheaper than other sellers, therefore not being so greedy about profits. The larger stores like Asda/Walmart are known to sell well below and stick to the manufacturers recommended selling price. However, there are instances where sellers are selling what look like and are sold to appear as the genuine thing, but they are in fact replicas/fakes. If someone wishes to buy these that is fine. But, price can be an alert if generally speaking the genuine product is never going to be as cheap as these replicas are being sold at. I bought some brush heads on eBay last November. They match original oral b heads in every respect but they are a tight fit on the brush, the bristles seem sharp and after three months of use have not faded. Yesterday the head stop working and a steel pin fell out. They are listed as genuine but I don’t think they are. The only obvious difference is the packaging, the original ones have PET stamped into the plastic. Thanks for the insight Phil. The quality of the fakes is very high and it is very difficult to tell them apart. Now reported to Oral-b who are going to investigate and are sending me some free heads as a good will gesture. Also I bought a pack of 3 pieces of oral b dual clean on ebay months ago and a few weeks ago I realized that it was broken a piece with the risk that I could swallow some fragment of the inside of the toothbrush! now I bought the “crossaction” on Amazon, hoping that this is not false! Hi i just want to know do the fake ones clean same as the real ones ? do they move in the same way ? will i get the same results ? Hello, thank you for your very informative website. I’m afraid I’m yet another unwitting victim of these fake Oral B toothbrush heads! Since my favourite Oral B Dual Clean heads have largely disappeared from the shelves of the big retailers, I have turned to Ebay as a source but have been duped twice into buying fakes by unscrupulous sellers. The fake heads break off in your mouth after a few uses. Terrible. I have now written to P&G to find out about reputable sources for the Dual Clean heads. I fear however that they may have been discontinued by P&G due to rampant counterfeiting from countries like China. Adrian. Sorry to hear this. I do believe they may have been discontinued too in preference to the ’round’ heads. However, P&G should be able to confirm to you. Unfortunately, I purchased fake replacement heads from Ebay (Fabfabdeals). A pack of 8 cost £15.99. Half of them the toothbrush head came off in your mouth! Very dangerous! I thought they were genuine due to the packaging which looked real enough. This has helped me to recognise fake brushes and hopefully I wont make the same mistake again. I’ve just purchased some from Amazon and they are genuine; I can see the difference now. I don’t believe that 3 holes at the back of the brush head instead of one indicates it is a fake. The videos of the “Crossaction”, “3D White”, “Sensitive Clean”, “Floss Action”, “Precision Clean” and “Kids” models all clearly show 3 holes at the back of the brush head. I think your guide to fakes is misleading, as P&G have confirmed that 3-hole brushes are indeed genuine. Thank you for the comment regarding fake Oral-B brush heads. We appreciate you pointing out what was a possible error in our guide to possible counterfeit brush heads. This post came about after a great deal of research and hands on with different brush heads from official and non-official routes and was put together with the best intentions, based on the information we understood to be true at the time; but have always made clear that the information is provided as a guide and for information only with the content being subject to change. Having reviewed the videos you have linked us to, we are indeed able to see the multiple cut outs on the back of the brush head. As such we have made some slight revisions to the page on our site to reduce the importance that someone may place on this piece of information. The text we have in the post does still refer to multiple cutouts on the back of the head being a possible sign of a fake, but have stressed that an original may also have such. The post was never designed to mislead and only to inform and advise consumers of what to look out for, Throughout the post, on the infographic and in the paragraph ‘Getting the final word on whether it is a fake’ we have made clear that consumers should speak to Oral-B directly for confirmation. My genuine Oral B toothbrush came with a three-hole version of the crossaction head…but the replacements I just bought only have one hole. Perhaps they have changed the design. I’d advise people to avoid the three-hole version if they can because the plastic between holes can break and lead to very painful pinching in use. thank you i purchased the multi pack and have had problems ever since as they were fake with 3 holes on the back of the head ,just purchased from a high street retailer only one hole in the back and teeth feel cleaner and no sore gums. Hi. Sorry to hear you have been subjected to fakes but glad you now have an original and can tell the difference. Are you able to share any images, links or details on the fakes here in the comments? Anything you can add will really help us and others better understand what to look for and how not to become victims of those who produce fake brush heads. Thanks. I am very grateful for this video. I bought heads on Amazon and was suspicious because of some negative reviews mentioning fakes, and because the packaging was rather flimsy. But I am not convinced they are genuine, which is reassuring. Many thanks! That should have read “I am now convinced”. Sorry!